Trump Blows Off Debate Prep Again [VIDEO] - Joe.My.God. This was not the debate tune-up that jittery Republicans were hoping for. Only days before Donald Trump must face Hillary Clinton in a town-hall style presidential debate, the GOP nominee added just such an event in New Hampshire. It was seemingly a concession to anxious allies and advisers hoping he might hone his skills in what can be a difficult format even for the most dexterous of politicians. Trump had other plans. “They were saying this is practice for Sunday,” he told the crowd in speech before the so-called town-hall. “This isn’t practice. This has nothing to do with Sunday.” He wasn’t wrong. The format was nothing like what Trump will face in St Louis, when half the questions will be posed by uncommitted voters, and the candidates will have two minutes to respond to each question as Martha Raddatz of ABC and Anderson Cooper of CNN serve as moderators. 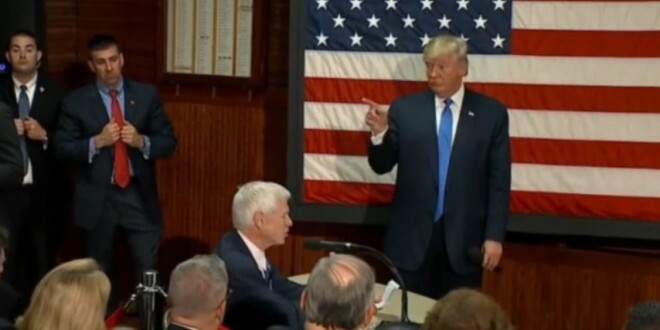 On Thursday night, Howie Carr, a conservative radio host and Trump booster, played the role of moderator, and the crowd was hand-picked by his campaign. The audience didn’t even ask Trump their questions. Carr did so on their behalf. Before the event, Carr had said Trump would take 20 questions. He stayed for about a dozen. And while Sunday’s debate will stretch for 90 minutes without a bathroom break, Trump bolted from his town hall in Sandown after barely more than one-third of that time.